NETWORK UPDATE: The WOMENS WORLD CUP FINALS adjusted up 0.6 to 7.0 in final numbers. The primetime NASCAR telecast turned out to be a very long rain delay, and it lost 0.1 to 0.7. In addition, BIG BROTHER and CELEBRITY FAMILY FEUD received 0.1 bumps. CABLE HIGHLIGHTS: Sunday marked the start of Shark Week, Discovery’s favorite week of the year, and it dominated Sunday cable with 4 of the top 5 shows. MONSTER MAKO took the honors for the biggest of the sharks, although its 1.51 rating was a bit lower than the 1.88 that SHARK OF DARKNESS earned on the first night of 2014’s Shark Week (which took place in August). MONSTER was followed by ISLAND OF THE MEGA SHARK at 1.38, with SHARK TREK at 1.12 and SHARK AFTER DARK at 0.78. The big teeth of the competition didn’t hurt HBO too much, as TRUE DETECTIVE fell 0.18 to 1.15, BALLERS was down 0.11 to 0.78, and THE BRINK lost 0.04 to 0.51. (LAST WEEK TONIGHT took the week off.) The season finale of PENNY DREADFUL on Showtime jumped a tenth to 0.30. On AMC, the 2d episode of HUMANS took an ugly hit, down 0.21 to 0.32, while in that context, lead-out HALT AND CATCH FIRE (which creatively just keeps getting better) didn’t look so bad, down only a hundredth to 0.17. At TNT, THE LAST SHIP fell 0.18 to 0.67, and FALLING SKIES shed 0.06 to 0.44. FOOD NETWORK STAR rose 0.06 to 0.71, lead-in GUYS GROCERY GAMES lost a tick to 0.41, and lead-out CUTTHROAT KITCHEN held at 0.52. BAR RESCUE (Spike) bumped up 0.05 to 0.58. 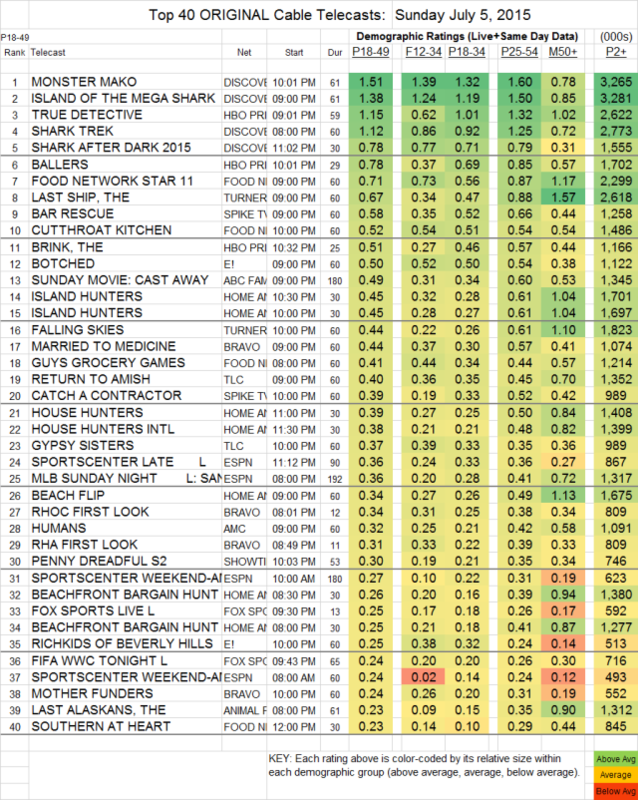 On E!, BOTCHED lost 0.07 to 0.50, while RICHKIDS OF BEVERLY HILLS gained 0.03 to 0.25. Bravo’s MARRIED TO MEDICINE was at 0.44. BIG BROTHER AFTER DARK (POP) was at 0.07/160K.